Buckhead Betty ... on a Budget: Books, Gardens, and a Giveaway! Books, Gardens, and a Giveaway! Whoever you are, we all like to give back to the communities around us in some way. Here in Atlanta, some of you might be members at the High Museum. Or perhaps you are a contributing patron of the ASO, or a volunteer at Piedmont Park. Maybe you give your time and/or money to something in your suburban neighborhood, like an area school or church. I talk about the Atlanta Botanical Gardens all the time, I know. But they just continue to impress me! They offer fantastic events around the holidays, feature some of the coolest new exhibits, and all summer long, they treat us to drinks and appetizers from the hottest restaurants in town. I am not only supporting their gorgeous gardens, but it's fun for us, too. Well, today I got the e-newsletter about the July line-up of events, and I am just so excited. Yes, they are featuring fabulous restaurants like Pricci, TAP and Murphy's. Yes, they will have a full line-up of cocktails infused with things grown right in their Edible Gardens. Most intriguing of all, though? 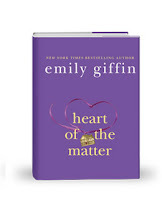 They are going to have Emily Giffin there for a book signing on July 15th! You may know Emily from her much-read books Something Borrowed and Something Blue, but she is back on the circuit these days with her new book Heart of the Matter. Even cooler, she is an Atlanta girl herself, so you know she rocks. So here's the deal -- forget the admission price. I want to take one of YOU, my lovely readers, to this fantastic event with me! How do you enter to join me? Just leave a comment on this post about one of your favorite authors -- it can be anyone. Double entries if you also leave me the name of your favorite book. I will randomly pick the winner on Tuesday, July 6 at 5pm ET, so be sure to enter before then. If you aren't a winner, I hope to see you there at the event! C.S. Lewis "Until We Have Faces" Fell in love w/ this book in high school and I still love it! my favorite book is the other boleyn girl. i've read it at least 4 times!